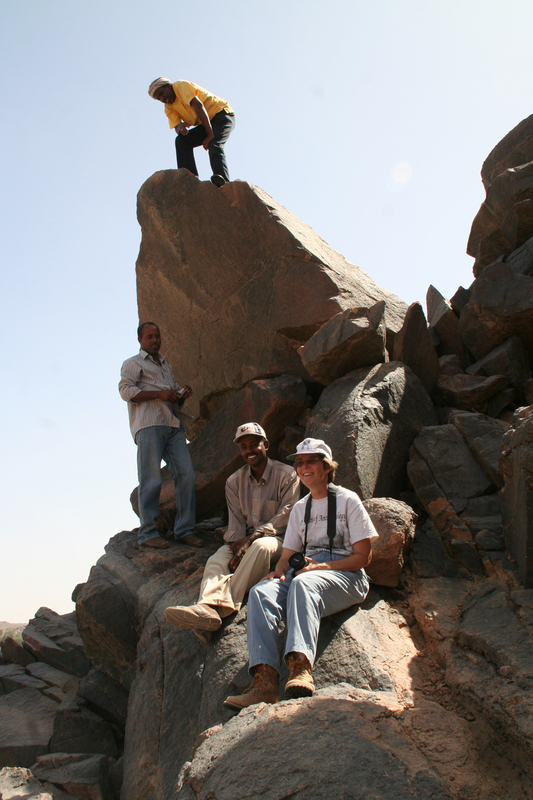 ASU bioarchaeologist Brenda Baker poses with her Sudanese field crewDr. Brenda Baker is a core faculty member of the Center for Bioarchaeological Research and Head of the Bioarchaeology approach (subfield) since 2012. Dr. Baker taught previously at Tufts University (1992) and Minnesota State University Moorhead (1993-94), and was Director of the Repatriation Program and Curator of Human Osteology at the New York State Museum from 1994-1998. She is the founding co-editor of the new journal, Bioarchaeology International. She has served on the Executive Committee of the American Association of Physical Anthropologists (2012-2015), as an Associate Editor of the International Journal of Paleopathology (2010-2015), and is a founding Steering Committee member of the Western Bioarchaeology Group (2012-present). Her teaching includes upper-division undergraduate courses on the Global History of Health, Life and Death in Ancient Egypt, Bioarchaeology, undergraduate and graduate courses in human osteology, and graduate courses in paleopathology and The Bioarchaeology of Children and Childhood.